GexCon has extensive experience in dust explosions, aerosol explosions, vapor cloud and gas explosions. GexCon has licensed Certified Fire and Explosions Investigators (CFEI) and Professional Engineers (PE) that have investigated numerous explosions ranging from small vessel explosions to large explosions at chemical processing and petrochemical facilities. Many of these incidents involve propane, natural gas and flammable liquids. 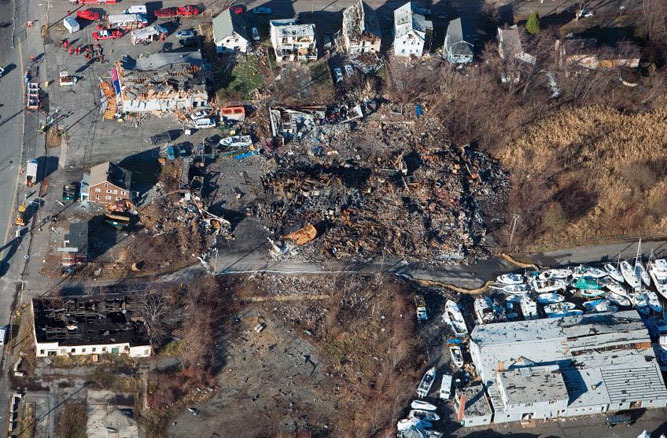 GexCon investigated the cause of the 2006 explosion of an ink and paint manufacturing facility in Danvers, MA as shown below. 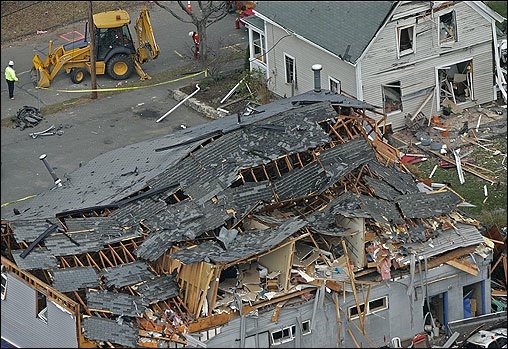 GexCon performs site inspections and employs state-of-the-art equipment to locate the origin and determine the cause of the explosion. If the incident involves a fuel gas, such as propane or natural gas, GexCon can perform analyses to identify the location of the leak and quantify the size of the leak. These involve sampling the soil for fuel gas, pressure testing, excavation to evaluate gas pipelines and gas service mains, testing of combustion controls, and performing ground penetrating radar to identify underground migration pathways. GexCon staff is familiar with the procedures involving liquid sample collection of LPG and its subsequant testing for odorant levels and chemical composition. GexCon has conducted numerous full-scale experiments on gases and vapors, including releases, dispersion studies, and the ensuing vapor cloud explosions. Based on these experiments, GexCon has developed the industry recognized CFD software FLACS, which is capable of modeling releases, dispersion of vapors, ventilation in structures, and ignition of flammable fuel-gas mixtures to evaluate the flame progression and overpressures due to explosions. 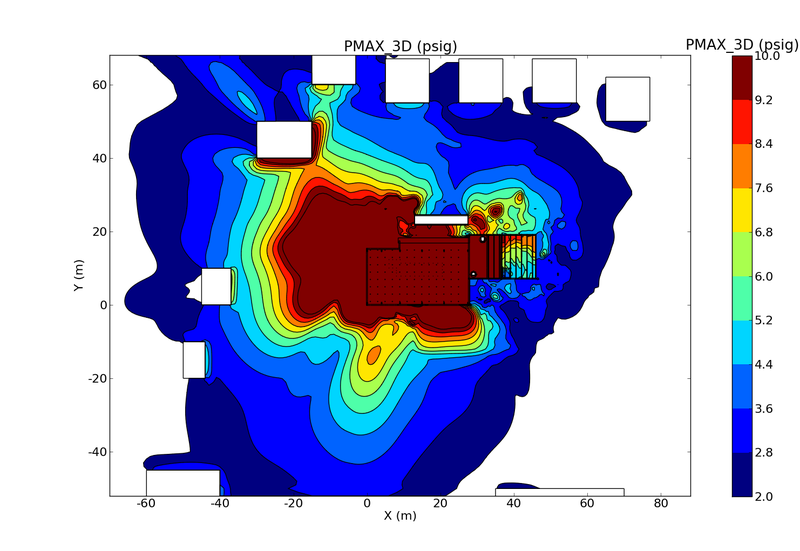 Unlike simple models, FLACS is a powerful tool that can be used reconcile the predicted overpressures and dynamics of the explosion with the observed near- and far-field blast damage. Therefore, FLACS can be used to evaluate the location of the ignition source, the release and migration of the gas or vapor, the strength of the explosion, the local flame accelerations, the resulting overpressures, and the blast wave. The image below shows the peak blast pressures from a vapor cloud ignition in the right section of the facility: note the asymmetric blast patterns within the facility and to the surrounding structures (as observed below). 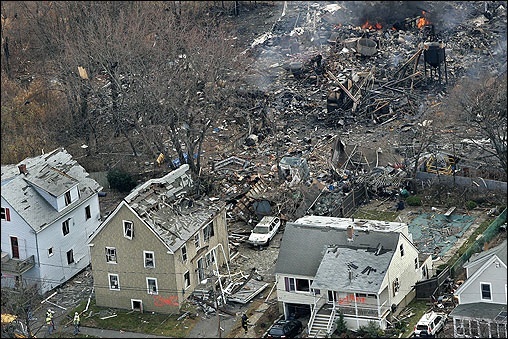 GexCon can also assist clients in developing strategies to prevent or mitigate an explosion by conducting consequence safety studies of new or existing facilities, implementing methods to reduce explosion hazards, designing testing programs to evaluate the hazards of various fuel-oxidizer mixtures, and optimizing gas detector placement. Davis, S.G., Hinze, P., Hansen, O.R., and van Wingerden, K., 2005 Buncefield Vapor Cloud Explosion: Unraveling the Mystery of the Blast, Paper presented at Interflam meeting, Nottingham, UK, July 5-7, 2010.